OWWM badges are often pretty beat up by Father Time, sometimes being in even worse condition than the machine they are attached to. 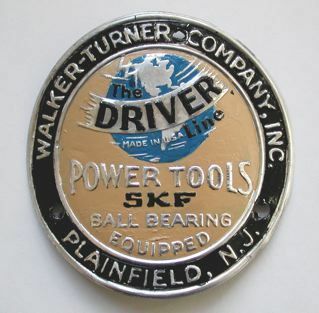 Depending on the level of restoration being undertaken on the machine itself, it may be desirable or even necessary to restore the badge up to the same level. Old badges were often quite colorful, in contrast the the frequently monotone paint schemes of the machines themselves, and thus can add a very nice splash of colour to the project. Here are some different methods that others have used successfully to restore the badges on their OWWM. 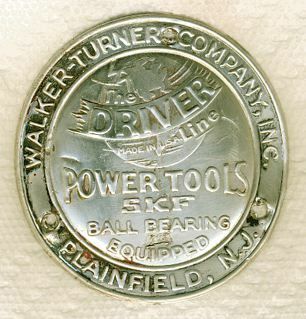 Here is a W-T badge that lost virtually all its original paint when attempting to remove a coat of paint it had received at some point in the past. Though not completely true to the original W-T scheme, it turned out very well, and is quite attractive to boot. This scheme uses more of buff/tan field color instead of the original milky yellow. Spray paint for the outside ring, Testor's Blue, Black, and Sand for the insides. Maybe not like the original, so let's call it "Walker-Turner inspired"! Note: Oftentimes badges will have one or more coats of paint over top of the original colors, as in the example above. These layers may be carefully removed with carburetor cleaner and a white scotchbrite pad. 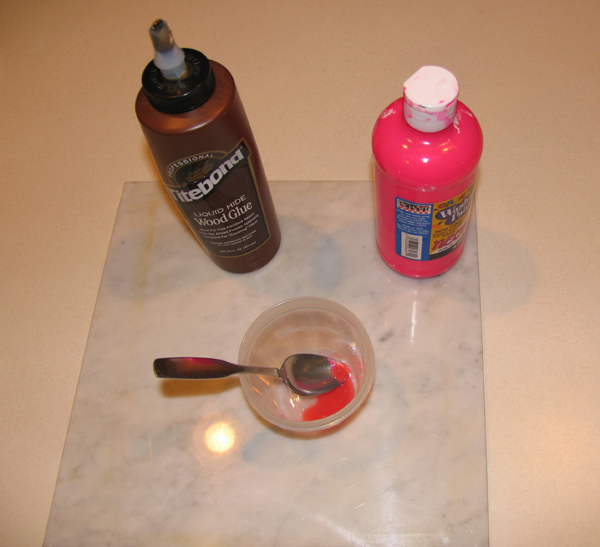 You have enough control to see when you are dissolving the base color. Hide glue was selected as the maskant. Some bright washable poster paint was mixed in to make the glue show up better. make sure you mix in "enough" color. 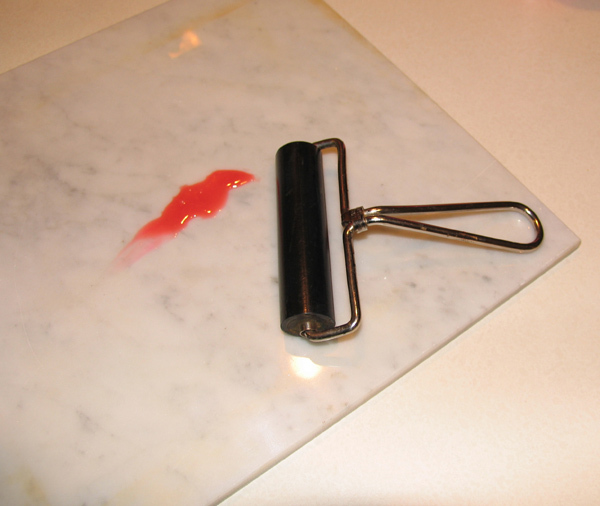 A brayer, which is a small, hard roller used in printmaking, was used to roll a very thin layer of the mixture on a marble tile. The goal is to roll it until the brayer is coated with a very thin uniform layer of material. It was then rolled across the tag. You may have to add more color to the maskant if it is not readily visible on the tag. Note that multiple passes will tend to lead to contaminate the areas not to be painted. 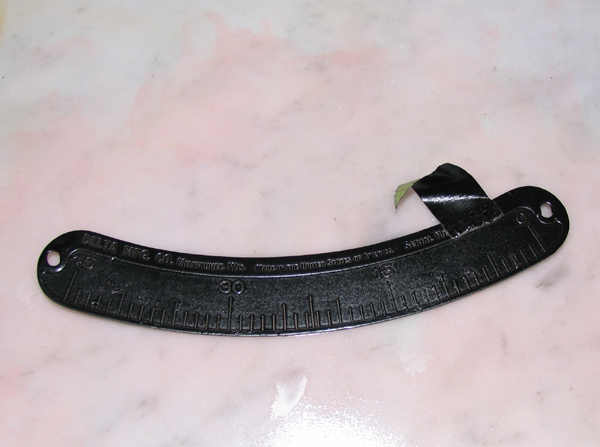 Since the glue should be thin, it will be easily removed with water (or other appropriate solvent depending on the maskant) until you get the application right. The tag is virtually perfect. The two exceptions are the area on the left that had severe scratches and dent that left a high spot, and a little patch at about 10 degrees where some glue accidentally got in the field. These can be touched up. Overall a very nice result, and the whole process was very quick.